Species name meaning 'religious', referring to its religious importance or location near temples. Occasionally found in deciduous forests of the lower slopes, in grassy areas and close to cliffs. More or less established in Penang and very conspicuous in cultivated ground round the town, near Dato Kramat growing in a native settlement, in Malacca Griffith noted 'near a stream at the foot of... hill"; in N. Bali near a large pagode (Teysmann) pr. Singaradja. At Buitenzorg [Bogor] flowering throughout the year. In Penang noted as deciduous. All specimens at low alt. It is propagated by cuttings or rather loppings; any branch stuck in the ground will strike in wet weather. Flowers last for 1.5 day. If the flower is setting fruit the withered petals remain for a long time. In India, and most of its current range, it is often used as a temple plant, and flowers are used in offerings. This silky cotton is said to induce sleep when stuffed into pillows. Leaves are eaten by the sambar dear. Bark is used for the preparation of medicines. The immature fruit is cut at the top and inner material is removed. A flour of ragi and gram with jaggery is put inside the shell. The opening is sealed with the cut piece. This is put into the fire and cooked. The cooked mixture is given to cure tumours of the stomach. Native to India, Burma and Thailand, but introduced in many current or formerly hindu regions in Southeast Asia, like Sri Lanka, Peninsular Malaysia, East Java and Bali. 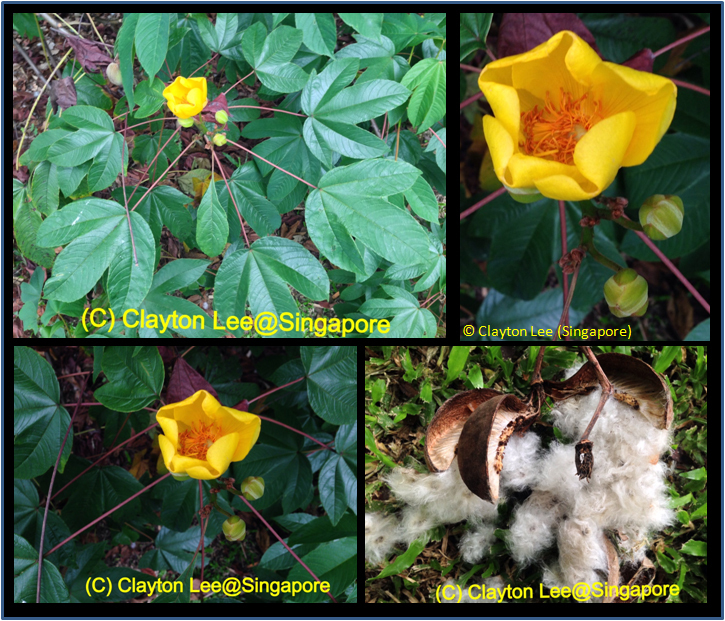 English: Buttercup tree, Yellow cotton-tree, Yellow silk cotton tree. India: Galgal (Hindi), Ganeri (Marathi), Kattupparutti (Tamil), Kondagogu (Konkani), Sonali simul (Bengali), Arasina buruga (Kannada), Cempanni (Malayalam), Konda gogu (Telugu).